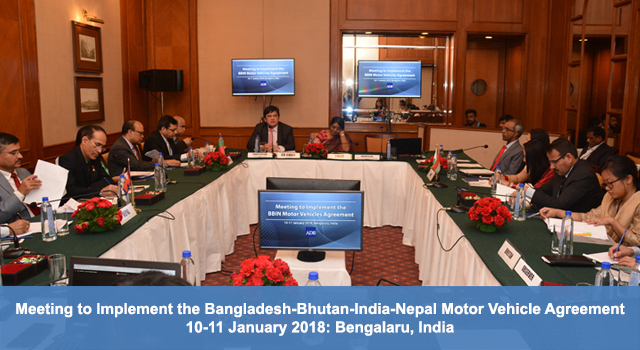 India's Ministry of Road Transport and Highways and the Asian Development Bank (ADB) organized a meeting on the implementation of the Bangladesh-Bhutan-India-Nepal Motor Vehicles Agreement (BBIN MVA) on 10-11 January 2018 in Bengalaru, India. Agreed to work toward finalizing the protocol for cargo vehicular movement. 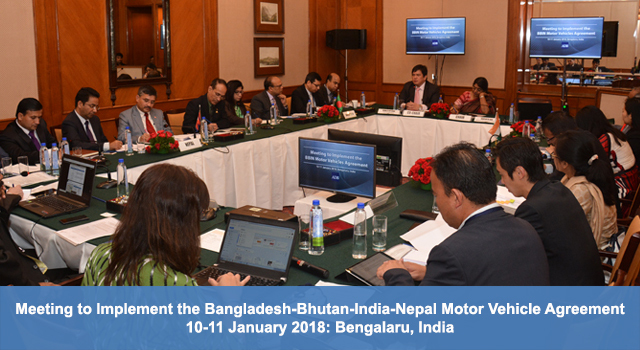 Ms. Dakshita Das, Joint Secretary (International Cooperation), Ministry of Road Transport and Highways, India, chaired the Meeting. In her opening remarks, she emphasized the importance of BBIN MVA in promoting regional connectivity in the subregion. Mr. Ronald Antonio Q. Butiong, South Asia Regional Cooperation and Operations Coordination Division, ADB, co-chair of the Meeting, highlighted the critical role of the BBIN MVA in realizing seamless movement of passenger, personal, and cargo vehicles along corridors linking the BBIN countries. 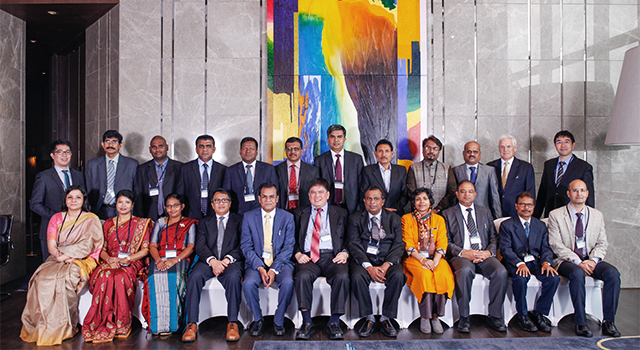 The Meeting was attended by delegations from Bangladesh, India, and Nepal, and was supported by staff and consultants from ADB. 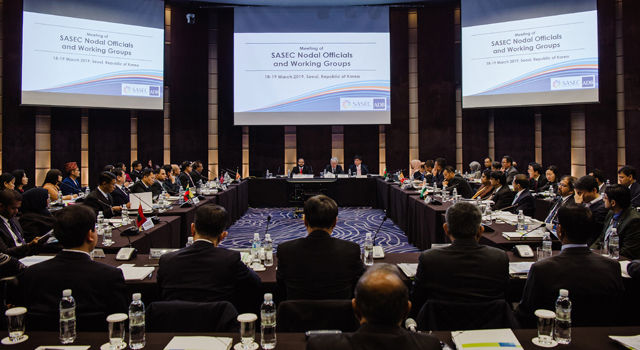 Bhutan participated in the Meeting as an Observer. 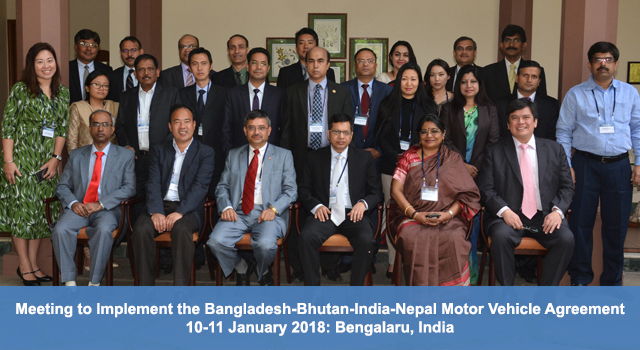 The BBIN MVA was signed at the BBIN Transport Ministers’ Meeting held in Thimphu, Bhutan in June 2015. 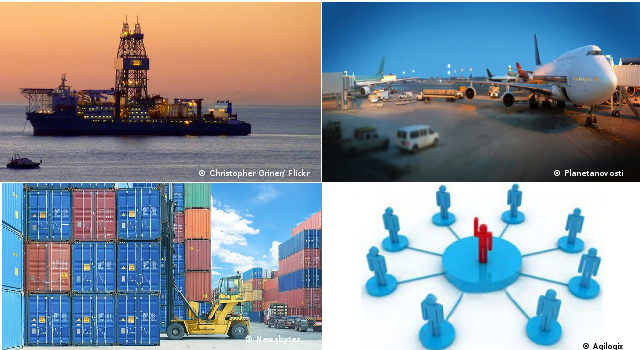 It is a landmark framework agreement designed to facilitate passenger, personal, and cargo vehicular cross-border traffic between and among the four countries to reduce costly and time-consuming transshipment of people and goods at border crossings, and create opportunities for greater economic exchanges along designated key trade routes in the four countries.